Featuring ultra quiet, energy-efficient performance and increased safety, the Fellowes Fortishred 2250S Strip-Cut Paper Shredder is perfect for your shared office. 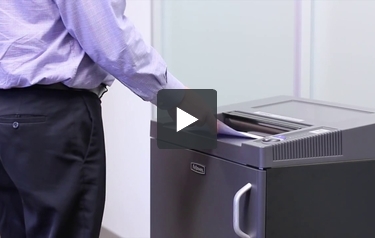 Designated a Security Level P-2 shredder (TAA Compliant), the 2250S destroys up to 20 sheets of sensitive material per pass as well as handles DVDs/CDs, credit cards, paper clips, staples, and more. Equipped with a 20-gallon removable basket for easy shred disposal, the 2250S is designed for continuous use and 3-5 users. Each unit comes with a 2-year warranty. Product number 4616301. Throat Width 10.25" 10.25" 12" 15.75" 15.75" 10.25" 10.25"
Unit Dimensions (H x W x D) 34.25" x 19.7" x 15" 40" x 21.75" x 23.5" 38.2" x 25.2" x 23.25" 36.5" x 19.5" x 18.5"